Brucellosis, being a systemic disease, may affect many organ systems. The involvement of the musculoskeletal involvement is associated with 10–85 % of the focal complications. Spinal involvement is one of the most commonly encountered localized forms of human brucellosis. It is a destructive disease process requiring a correct and early diagnosis and an immediate treatment. 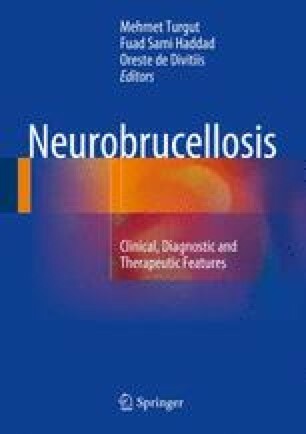 Spinal brucellosis is more prevalent in older patients or in subjects with prolonged illness prior to treatment. The lumbar vertebrae are involved more frequently than the thoracic and cervical ones. Paravertebral, epidural, and psoas abscess can occur in the setting of brucellar spondylitis. Medical treatment for brucellar spondylitis should consist of two antibiotic agents for at least 12 weeks.